I've been digging the blues lately, especially the gritty garage variety, so when The Rumble's latest press release described one of the bands, Rumspringa, as "LA based blues soaked rock act... in the vein of the Black Keys," it caught my attention. "Shake 'Em Loose Tonight" (mp3) does seem to capture some of the Black Key's laid back amble. Filling out the lineup are San Francisco's A B & The Sea and Portland's Nucular Aminals, whose playful and free-spirited indie pop I saw last year at Berbati's during their residency there. Don't know much about A B & The Sea, but the upbeat and retro pop on their homepage is pretty catchy. It reminds me of The Explorers Club. Overall, it seem like a fun show. Plus, it's free. It's on August 3rd at Holocne. If I'm not completely burnt after PDX Pop! I'll be there. 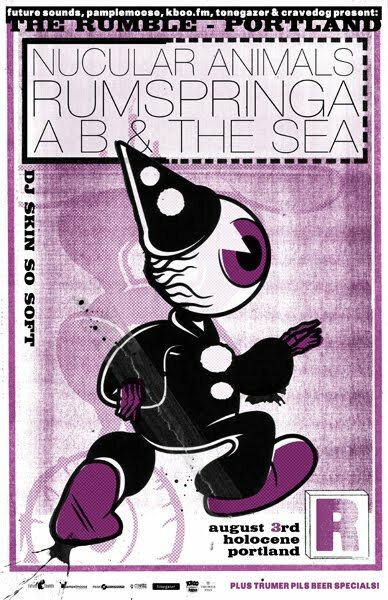 After spending more time listening to their songs, I think A B & The Sea is the band I most want to go see. Check out "Bone Dry" (mp3). They are quite good. I've seen them twice as openers or second billers. San Francisco reppin' in Por'land.